Have you ever woken up in the middle of the night in a dark, unfamiliar hotel room, and really had to go to the bathroom? You know what general direction the bathroom is in, but the trip seems daunting. You’ll almost definitely stub your toe on the way and you might even walk into a wall or two, but you’re 99% sure you’ll make it eventually and 100% sure you’ll be glad you made the trip. That is the exact same feeling I had last July, when I pushed off the dock in Norwalk, CT, setting sail on my newly acquired Catalina 27 to travel America’s Great Loop. Well, I didn’t actually have to go to the bathroom, although I felt the same – leaving a pretty comfortable situation for a potentially hazardous, but ultimately rewarding one. To give you a bit of a backstory, I grew up in Rowayton, CT, and went to Dartmouth College. After (shockingly) graduating in 2011, I worked for a real estate company in Boston for three years, and then applied to a few business schools in the spring of 2014. I was rejected by all but one “lucky” place: Dartmouth. When I was accepted, the first thing I did was look around for Ashton Kutcher to make sure I wasn’t getting “Punk’d” on some hidden camera TV show. The second thing I did was ask if I could defer my admission for a year and start school in the fall of 2015. The school denied my request initially but changed their minds about two weeks later, and I suddenly had a year off. So I sort of quit my job, and sort of, you know, BOUGHT A BOAT! 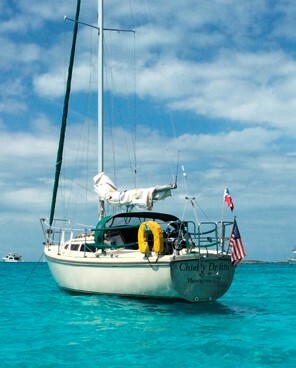 My parents owned a Contessa 35 when I was growing up, and we would go on a couple of family sailing trips every summer. But – and this is important – if any of you have ever been kids you probably know that family trips are about as cool as the chicken pox. Let’s just say I never caught the “sailing bug.” In my mind, sailing meant I was missing out on whatever fun stuff my friends were doing back home, and it was a lot easier for my older brother to beat me up because I was trapped with him in a 35-foot fiberglass case of terror. As I got older, though, I came to enjoy sailing more and more, and appreciate what I had taken for granted. One day, when I was talking to my dad about what I would do with a full year off before grad school, he suggested the Great Loop. For those who have never heard of it (I certainly hadn’t), the Loop is basically a circumnavigation of the eastern part of the United States. From Manhattan, the route runs up the Hudson River and across the Erie Canal into the Great Lakes, then from Chicago, IL to Mobile, AL on a series of inland waterways, then across the Gulf of Mexico, down around Florida, and back up the East Coast. After about an hour of research, I was sold. It sounded like the perfect adventure. By the time I finished with my job and moved back to Connecticut it was May, and I was on a pretty tight schedule. Having done a ton of research (i.e. listening to Gordon Lightfoot’s “Wreck of the Edmund Fitzgerald” a few times), I knew that the gales of November sometimes come early, and I wanted to be through the Great Lakes by the middle of September. That meant I needed to leave Connecticut sometime in July, which meant I needed to find and buy a boat ASAP. The first five or six that I looked at were total duds, and then finally, The boat presented herself. Actually, my mom found her on Craigslist…which I really hope is not how I’m describing my wife in 20 years. So I had a boat! A 1987 Catalina 27 with a 14-hp inboard diesel engine. She had a few issues that I knew of – depth finder, knot meter and fuel gauge didn’t work, batteries were almost shot, holding tank had a leak – and plenty more that I have since discovered, but was more or less ready to go. There was just one little problem: I had no idea what I was doing. A side effect of not being particularly “passionate” about sailing during my childhood was that I never bothered to learn the first thing about boat maintenance, navigation, anchoring, and so forth. That stuff all fell under the jurisdiction of “Mom” or “Dad.” I did know the basics of putting up sails and trimming them, but I didn’t know how an engine worked. And so on and so on. After buying the boat in early June, I took a month to get her ready, but more importantly, to get myself ready. I picked my dad’s brain, explored her many nooks and crannies (which is also not a way I hope to be talking about my wife in 20 years), and convinced my friend Rob to join me for a trial run from Rowayton to Cape Cod for the 4th of July. After returning from the Cape I spent another week getting prepped, and launched on July 19, 2014. As I write this on May 10, 2015 – spoiler alert! – I’ve made it all the way around to Charleston, SC, and what an adventure it has been. I have covered 5,000 or 6,000 or 7,000 miles (I lost track after about 150) and spent time in three different countries (Canada, the Bahamas and the U.S). I’ve sailed on rivers, lakes, bays, sounds, canals, gulfs, oceans, bayous, the ground (whoops), and railroad tracks (yes, seriously). I’ve taken my mast down, then put it up, then taken it down again, and then put it up again. I’ve swum in fresh water, salt water, and everything in between. To go back to the hotel room analogy, I’ve stubbed my toe plenty of times along the way. 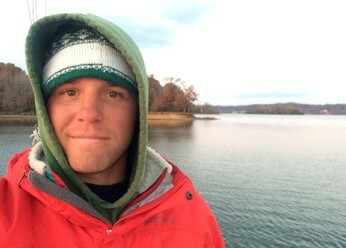 In just the first two months of the trip, my alternator failed and I lost all electronics, my engine overheated because I mistook the smell of leaking coolant for old hot dogs, I had to figure out how to go through canal locks by myself via trial and error (and error, and error, and error), I lost my main halyard at the top of the mast, the tack of my jib ripped out of the headstay, I woke up in the middle of the night with the anchor dragging (more than once), and I was fined by the Coast Guard because I didn’t have enough lifejackets for the seven bikini-clad girls on my boat. Alright, that last one didn’t actually happen. But I did hit a rock. 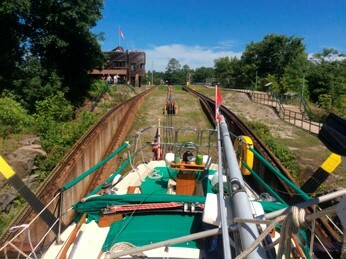 It was mid-late August and I was up in the Georgian Bay, having successfully (with the exception of everything listed in the last paragraph) navigated the Hudson River, the Erie Canal, Lake Ontario, and the Trent-Severn Waterway. 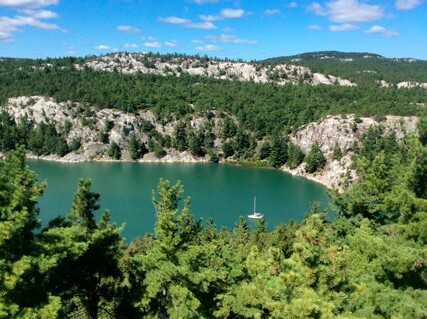 The Georgian Bay is a spectacular cruising area, with rocky terrain that reminded me of coastal Maine and reminded the bottom of my boat that rocks are hard. After spending a night in a beautiful, remote anchorage, I was on my way back to the primary “small craft channel,” passing through a narrow cut at about 5 knots, and then BAM! Then BAM again! The first bam was my keel hitting the rock, and the second was my heart wedging itself firmly into my throat. I jumped into the crystal clear water to survey the damage, and saw a chunk of lead taken out of the keel (which I’d expected), but thought everything else looked okay. I was very relieved. Unfortunately, I was also very wrong. Over the next few weeks, I noticed that my automatic bilge pump had started running more often, which meant that water was sneaking into the boat from somewhere. Procrastinating is generally the only thing I do with any sense of urgency, so I told myself I’d get the boat hauled out of the water at some point in the future and worry about it then. Three months and thousands of miles later, after passing through the North Channel, Lake Michigan, the Illinois River, the Mississippi River, the Ohio River, the Kentucky Lakes and the Tennessee-Tombigbee Waterway, I arrived at Turner Marine in Mobile, AL, and decided that time had come. I’d soon be crossing open water on the Gulf of Mexico, and wanted to get any issues sorted out before then. It turned out to be one of the smartest decisions I’ve ever made, ranking right up there with…hmmm…Never mind, there’s not too much competition in that category. When the boys in the boatyard hauled her out, one of them walked over and put pressure on the side of the keel with his foot. It started to rock back and forth, and that’s a type of “swing keel” that no boat is supposed to have. The keel bolts were fine, but the fiberglass that runs along the base of the keel had been totally compromised. The first question they asked was, “Do you have insurance?” As it turns out, if my answer had been no, the whole trip probably would have been done right then and there. The fiberglass repair was very extensive, and very expensive. In fact, the insurance agent almost considered the boat totaled. I spent January in Mobile, on a boat that was sitting out of the water on stilts. For about two of those weeks, almost the entire cabin was quarantined with plastic sheeting to prevent the spread of fiberglass dust, and I lived on my 6′ x 6′ v-berth, climbing in and out of an overhead hatch. By the end, I wasn’t sure if the plastic sheeting was protecting my man-cave from fiberglass dust or protecting the dust from the smell of my man-cave. The keel did eventually get fixed, and on February 1 I was moving again. Beyond that snafu, the scariest part of the trip was weather-related. 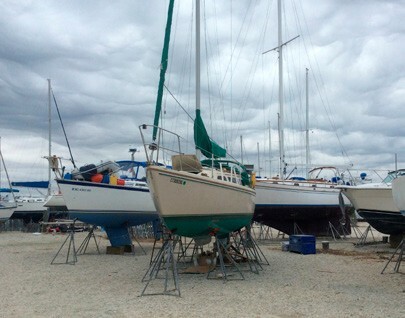 Just east of Mackinac Island, on Lake Huron, I got caught in a nasty thunderstorm with gusts up to 60 miles per hour. The wind was strong enough that I had my sails down and engine fully throttled, and still couldn’t point the boat into the wind. Yes, that’s right, I couldn’t even pass wind…which was a particularly big issue in this case, because there was a reef about a half-mile away that I was being blown directly toward. The only other boat I could see was the American Spirit, which happened to be a 1,000-foot freighter that didn’t appear to be having any trouble with the weather at all. I felt pretty lonely. As I struggled to hold my own versus the wind and the quickly mounting seas, I remember jealously glaring over at the Spirit and wondering if the captain, sitting in his warm cabin, had even noticed it was raining. It turns out that he might not have been paying as much attention as he should have! The following weekend, having survived the storm, found an anchorage and taken a couple of days to lick my wounds, I was listening to local radio and the DJ mentioned something about a freighter that had been pushed aground in a recent storm near Mackinac Island. Upon further investigation, my sources (Google) informed me that it was none other than the American Spirit. The article I found even said “there were no reports of any other vessels having trouble related to the storm.” Right…clearly they hadn’t been reading my blog. In spite of the discomforts and near-disasters (or maybe because of the discomforts and near-disasters? ), it’s been an experience that has surpassed all of my expectations. It has also surpassed all of my family’s expectations…literally. They admitted recently that they put together a secret betting pool about how far I’d actually get. Thanks for believing in me, guys. I’ve had quite a few visitors along the way (friends, family, a stray cat that jumped aboard and scared the crap out of me one night, etc. ), but I have done about 80% of the Loop by myself. And I think I’ve managed to maintain about 80% of my social skills, without turning into too much of a weirdo. I’ve figured out enough about this whole boat thing to consider myself – knock on wood – a competent sailor, and recently made it across the Gulf Stream and back, cruising around the Bahamas for a month. 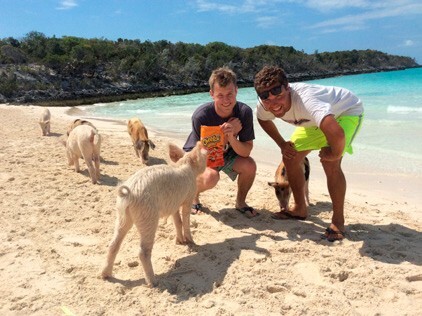 I would even go so far as to say I’ve matured a lot…if not for the fact that the highlight of that Bahamas trip was feeding Cheetos to wild pigs on Big Major with my friend Tim. Above all else, the people I’ve met are probably what I’ll remember most. It hasn’t just been meeting other “Loopers” – who are generally some of the most friendly and helpful people I’ve come across anywhere, and who, with a couple of notable exceptions, are generally retired couples in their 50s or 60s – it’s been walking into a random town, finding a bar, and striking up a conversation with whoever the hell is sitting on the next barstool. Many people think of “traveling” as visiting as many foreign countries as possible, but I think there’s also something to be said for exploring your own country, and talking to some of the characters who fill it up. But the single best part about spending so much time by myself? I can completely fabricate stories about storms and rocks to make for an interesting magazine article!…just kidding. It’s all true, I promise. I’m now on the home stretch, heading back up the East Coast, and I suppose it’s time to start turning back into a civilized human being. 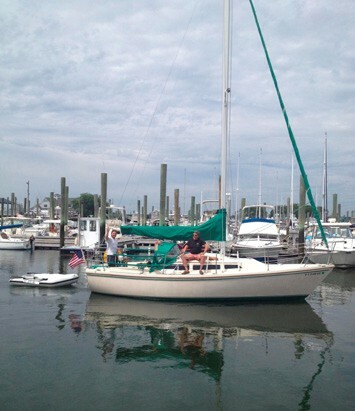 I’m planning to be back in Connecticut by late June or early July, try to sell the boat, and then head up to New Hampshire to start at school. Here’s to trading in charts for books, sails for snow boots, and seas for C’s. Onto the next adventure. Editor’s note: To read more about Kevin’s adventures – and misadventures – on the Great Loop, visit his very entertaining blog, The Deregtory, at thederegtory.wordpress.com.